To bowdlerize Bismarck, politics are "the continuation of war by other means," and continuing with Clausewitz, no other human activity is so "continously or universally bound up with chance." Winning is only half the battle, and while those whims mull whether he'll ever be sworn in, last week a leader threw himself into a Presidential vacuum and plugged it. Plugged it tight. As one Berliner said, speaking for the world, "We know there is a different America. He is the President in our hearts." As a practical matter, America's foreign policy framework changed last week, and although the change agent also visited Kuwait, Afghanistan, Iraq, France, and England as well as Germany, the symbolism provided by the last nation was resoundingly clear. The crowd in Berlin stretched for over a mile down two avenues radiating from the Victory Column, and the park in the Tiergarten Zoo was packed full to listen to the Senator. Newspapers estimated 200,000 people were there, but those streets are wide, and you could easily fit 200,000 people into a mile on any one of them. It looked at least half a million, if not a million. 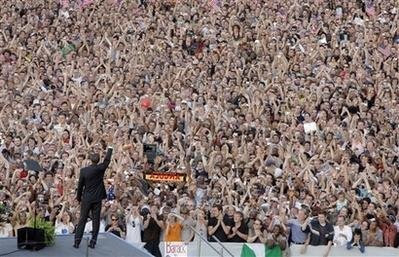 JFK didn't draw that kind of crowd in Germany. Reagan didn't. Hitler didn't. 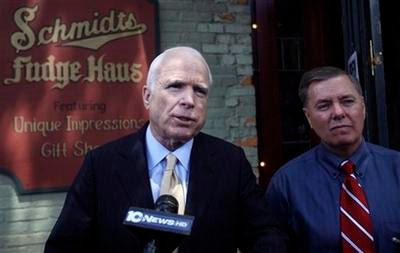 On the same day, his opponent John McCain cut a stark contrast, holding a presser in front of Schmidt's Fudge Haus in New Hampshire next to scandal-brewing Pugbot Lindsay Graham, who visibly cringed when McCain refused to allow a question from a Wall Street Journal reporter. The was no audience, only reporters. Even before the Berlin speech, the Republican campaign had expressed "frustration" over Obama's trip, and George Bush Senior helpfully explained from a golf course, "we're a bit jealous, is all." Republicans have been compelled to triangulate towards Obama's Mid-East proposals, seeking to minimize differentiation between him and their candidate. After Obama's 16-month withdrawal plan received public endorsement from Iraq's Nouri al-Maliki in the German weekly Der Spiegel, the White House suddenly announced its agreement to a year-and-a-half timetable for withdrawal from Iraq, following with a spokes-general PR campaign: not as many troops are needed on the ground because the Surge has worked so well, so they can now take the fight to the Taliban. And of course, the State Department opened direct, albeit secret, negotiations with Iran, signaling the decisive internal demise of one Richard B. Cheney. The rub in cleaving to all these new positions is clear: while fairly effective in blurring leadership differences, they're also doing Obama's bidding. He's where the leading is coming from, and the Republicans are abandoning policy agendas once held maniacally sacrosanct. How desperate must they feel? Hopefully this can begin to counteract blogsphere disgust over Barackian moves to the center-right. Naj is enraged over his refusal to acknowledge Iran's right to nuclear power, Bruce is ticked that Nader is being ignored, Zoey & Me hisses and spits over FISA, Orcinus bemoans recent softening on gun control. You know what? I agree with all of you, and there's a reason for my living in the closest thing to Denmark you can find in the US. Now, please hear me out for a minute. Kind-hearted people might of course think there was some ingenious way to disarm or defeat an enemy without too much bloodshed, and might imagine this is the true goal of the art of war. Pleasant as it sounds, it is a fallacy that must be exposed: war is a...dangerous business. Each deals with primordial emotions, competing social structures, and tidal waves of chance, so I see little strategic difference between politics and war, and indeed one activity eventually leads to the other. Politics is the art of mustering collective will to enact change, and it necessarily starts at the margins and works toward the center. To succeed, you have to learn to move elliptically, you have to work in curves, and I say that as someone who changed an entrenched academic bureaucracy, led a movement against its will, and amongst other threats, received personal cease and desist orders from my state Attorney General. (Which I ignored.) To succeed and weld the changes into place, I had to compromise on most issues, punt on others, kiss butts liberally, repeat myself almost constantly, and endure the enmity and traps of people far more powerful than me. Change is possible, but demands enormous sacrifice and patience, and frontal assaults on the ramparts of What Is are the most expensive kind, to be resisted above all others. Change is probably best achieved when it feels like experimentation, or even better, play. It's harder to notice then, more fluid, more adaptable, more capable of faith. It has to arc around the straight, and in so doing may better obey how the world is really structured, versus our conception of how structure should be. If you ever come upon a straight line of trees in the forest, you know they were planted by humans. We love to think in straight lines, and there are no straight lines in nature. Everything including light curves and disperses, matter agglomerates in ragged scattered orbits, and likewise the process of making good decisions is shamanic and arcane--competing factors aren't either/or, and in the moment it's difficult to distinguish the chaff from the coup de main. The human mind is wired for pattern recognition, the crowd is achingly predisposed to scarce simplicities, and when our theoretical searches for them prove fruitless we flourish easy answers out of entropies like fake bouquets from magician sleeves, glossing over immovable objects and irresistible forces. Rather than reject cheap tricks and accept factual ambiguities, "What pretty flowers," we exclaim, for results must be obtained. And they can be; the problem is that the work of obtainment, and the obsessive practice with prestidigitation required, is far less appealing than dramatic reveals and magic wands. If I were in charge of getting us out of Iraq, I would first reassure the generals in the Pentagon their budget is in no danger. I would then point out that Iraq obviously was not the source of terrorism, and hold up perfidious Taliban as the real enemy. I would propose shifting troops from Iraq into Afghanistan, sign a long-term security agreement with the Iraqi government in the context of oil access, and then proceed to empty Baghdad of soldiers, sending two home for every one sent to Afghanistan. Not, I admit, that sending soldiers to Pakistan's spongiform border will solve any problems; it is an oriental screen behind which an Iraqi withdrawal can take place, face can be saved, and appearances of weakness along with their deadly domestic and international consequences can be obscured. In Afghanistan, the objective of my soldierings would be to shower the supporters of the Taliban with cash, roads, and schools. Wherever resistance is encountered, my tactic would be the only one which has ever worked in the area: bribe the tribes. Bribe them into submission, then declare victory and get the hell out. Our presence there is probably harmful, but can be enlarged as a short-term, tactically sound, useful sleight of strategic hand. Although mine is an elliptical path to incomplete extractions, it curves in the right directions and would probably work. This is exactly what Barack Obama appears to be doing, and he is already forcing Republicans to bend to his will. That he has achieved such a feat beneath the radar but in plain sight of the national press is extremely significant, and I think worthy of further faith and investment. He is proving highly effective and probably downright brilliant. The cheering troops, the embassy staff in Baghdad giving a standing ovation, the world leaders with newly relaxed body language, the city of Berlin. They all see it, too. That said, I don't know if Obama will give Iran a fair deal, will be able to rein in a burgeoning domestic police state, will ever implement Ralph Nader's badly needed prescriptions for this nation, or if he'll get fewer Americans to shoot each other. Much less our military to stop shooting people around the world. I do know that each issue is a very tall order, the resistance to change is enormous, and each is in the realm of fightin' politics. If he takes a Clintonian approach to them, he will lose just like they did on Don't-Ask-Don't-Tell and Health Care. That stuff won't fly and them dogs won't hunt. All you can realistically do is point out a different reality, move the ball a little at first, take reasonable positions that are hard to deny and impossible to dislodge once gained. You keep building from there, and then you might win. Excellent. Absolutely excellent. Probably the best post you have posted on your blog so far. Excellent!!! Hey my floofy friend, glad you appreciated it, and thanks. As always, deeply eloquent .. though this slightly better than most .. heh. Hi im new here, I came accross this message board I find It quite helpful and it's helped me a lot. I should be able to contribute and assist others like it has helped me.